Peggy Brunache – archaeologist and food historian. Fritz Jean – served as governor of the Banque de la République d'Haïti, 1998–2001. From 2012, he has served as President of the Chamber of Commerce, Industry and Professions of the department of Nord-Est. Maggy de Coster – journalist and poet. Oswald Durand – poet and politician, said to be "to Haiti what Shakespeare is to England and Dante to Italy." Pradel Pompilus – writer and scholar, best known for his three-volume study of Haitian literature. Othello Bayard – musician, violinist, poet, and composer; wrote the music for the patriotic song "Haïti Chérie"
BélO – interpreter, composer and guitarist. Werner Jaegerhuber – known for composing "Messe sur les Airs Vodoussques". Andrée Lescot – folk singer; daughter of former President Élie Lescot. 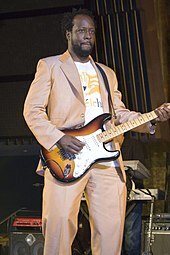 Webert Sicot – saxophone player, composer and band leader, and one of the creators of compas direct. He renamed the music cadence rampa after he left Nemours' band in 1962. 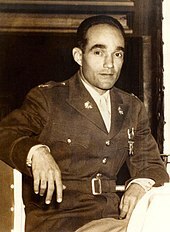 Philippe Derose – first Haitian elected to public office in the U.S.
Jonathas Granville – soldier, diplomat, civil servant, musician and poet. He promoted the emigration of free Blacks from the U.S. to Haiti. Joseph Balthazar Inginac – General of the Pétion-Boyer administration. Toussaint Louverture – leader of slave rebellion, military general in the Haitian Revolution. He declared himself Governor for Life of Haiti. Kervin Bristol – professional basketball player currently playing for the KK Włocławek of the Polish Basketball League. Robert Joseph – former professional basketball player who played in the Liga ACB in Spain for twelve seasons. Denso Ulysse – professional football player. Ange Jean Baptiste – judoka who has participated internationally. She won a silver medal at the 2006 Central American and Caribbean Games. Aniya Louissaint – Olympic Taekwondo athlete. ^ "Faculty Profiles". Trinity College. Archived from the original on 28 April 2011. Retrieved 22 June 2011. ^ San Miguel, Pedro L. (2005). The Imagined Island: History, Identity, and Utopia in Hispaniola. United States: The University of North Carolina Press. pp. 67–97. ISBN 0-8078-5627-4. ^ Schutt-Ainé, Patricia (1994). Haiti: A Basic Reference Book. Miami, Florida: Librairie Au Service de la Culture. p. 105. ISBN 0-9638599-0-0. ^ "Michel-Rolph Trouillot". University of Chicago. Archived from the original on 2007-12-14. Retrieved 2007-12-29. ^ Usmani, Sumayya (9 September 2017). "Sumayya Usmani's culinary journey: a Haitian love story". The Herald Scotland. Archived from the original on 10 April 2018. Retrieved 2018-04-10. ^ a b Michael R. Hall (2012). Historical Dictionary of Haiti. Lanham, Maryland, U.S.A.: Scarecrow Press. p. 31; 121. ISBN 978-0-8108-7810-5. Retrieved 5 May 2014. ^ Forero, Juan, ed. (15 February 2010). "Haiti's elite sees business opportunities emerging from reconstruction". Washington Post. Retrieved 14 July 2015. ^ Archibold, Randal C., ed. (5 April 2011). "New Haitian Leader Pledges Reconciliation". New York Times. Retrieved 14 July 2015. ^ Stotzky, Irwin P. (ed.). "Silencing the Guns in Haiti: The Promise of Deliberative Democracy". The University of Chicago Press. p. 121. ISBN 0226776263. Retrieved 12 November 2015. ^ Charles, Jacqueline (2012-11-28). "Viter Juste, Haitian community pioneer and leader, dies at 87". Miami Herald. Retrieved 2012-12-19. ^ "Activist Who Gave Name "Little Haiti" Its Name Passes Away". WFOR-TV. 2012-11-20. Retrieved 2012-12-19. ^ Pierre, Garry-Pierre, ed. (31 October 1993). "Amid Strife, Haiti Parliament Struggles With Itself". New York Times. Retrieved 16 January 2010. ^ Charles, Jacqueline (2009-12-07). "Haitian leader René Préval is on his honeymoon". Miami Herald. Archived from the original on 2011-07-14. Retrieved 2010-01-19. ^ "Haiti - Politic : Michel Martelly has designated Daniel-Gérard Rouzier as Prime Minister". Haïti Libre. 20 May 2011. Retrieved 7 May 2014. ^ "Daniel Rouzier Appointed as Honorary Consul for Jamaica to Haiti". Coconut Creek, Florida: Food for the Poor. 2 June 2010. Retrieved 7 May 2014. ^ Robinson, Brandon, ed. (23 June 2014). "Love & Hip Hop Producer Mona Scott Young & New York Knicks Legend John Starks Receive Carma Foundation's Lifetime Achievement Award". The Source. Retrieved 12 November 2015. ^ Farmer, Paul, ed. (29 July 2011). "Partners in Help: Assisting the Poor Over the Long Term". Foreign Affairs. Retrieved 12 November 2015. ^ David Grann, The Atlantic Monthly, July 2001, Giving "The Devil" His Due. ^ Herszenhorn, David M. (August 13, 1997). "Family Describes a Readily Friendly Man". The New York Times. Retrieved January 5, 2014. ^ "Chambers by department". Chamber of Commerce and Industry of Haiti. Retrieved 25 March 2015. ^ HaitiLibre. "Haiti - Economy : Installation of the 1st Support Service for Businesses in Ouanaminthe". HaitiLibre. Retrieved 25 March 2015. ^ Deibert, Michael (2011). "Notes From the Last Testament: The Struggle for Haiti". Seven Stories Press. p. 55. ISBN 978-1-60980-105-2. ^ Chambers, Seve. "Val-Inc Brings Haiti to a Bed-Stuy Studio". The Local – Fort Greene. Archived from the original on 25 February 2015. Retrieved 25 February 2015. ^ Ardain, Isma, ed. (7 March 2014). "A candid conversation with famed Haitian songstress TiCorn (Cornelia Schutt)". CSMS Magazine. Retrieved 17 February 2016. ^ Dorce, Ricarson. "Madeleine Sylvain-Bouchereau, Haïti (1903-1970)" (in French). Citoyennes. Retrieved 14 February 2016. ^ Claude-Narcisse, Jasmine (1997). "Madeleine Sylvain-Bouchereau" (in French). Haiticulture.ch. Retrieved 14 February 2016. ^ "Marlène Rigaud Apollon" (in French). ile en ile. ^ "Mimi Barthélémy". Africultures (in French). ^ "Jacqueline Beaugé-Rosier" (in French). ile en ile. ^ "Margareth Lizaire / Maggy De Coster". ile en ile (in French). ^ Zéphir, Flore (Fall 2012). "Creolist Michel Degraff: A profile of Commitment, Advocacy, Excellence and Hope". Journal of Haitian Studies. 18 (2): 268. ^ "Lilas Desquiron". ile en ile (in French). ^ "Jessica Fièvre". ile en ile (in French). ^ "Mona Guérin : une vie bien remplie". Le Matin (in French). ^ Berrouët-Oriol, Robert (13 March 2011). "Hommage à Paulette Poujol-Oriol" (in French). Potomitan. Retrieved 7 February 2016. ^ "Emmelie Prophète". ile en ile (in French). ^ "Évelyne Trouillot". ile en ile (in French). ^ Peitzman, Andrew B.; Rhodes, Michael; Schwab, C. William; Yealy, Donald M.; Fabian, Timothy C., eds. (2007). The Trauma Manual: Trauma and Acute Care Surgery. Lippincott Williams & Wilkins. p. xiii. ISBN 9780781762755. ^ Ono, David (20 January 2010). "Haitian-American L.A. doc opens clinic in Haiti". KABC-TV. Retrieved 10 October 2011. ^ "Fournier de Pescay (1771-1833)". Une Autre Histoire. Retrieved 14 March 2015. ^ "Board of Advisors". Emedex International. Archived from the original on 9 February 2015. Retrieved 14 March 2015. ^ "Emedex International Partners with Clinique Espérance Vie". Bethlehem Ministry. Archived from the original on 2 April 2015. Retrieved 15 March 2015. ^ Laura Lynn Windsor (1 January 2002). Women in Medicine: An Encyclopedia. ABC-CLIO. pp. 193–. ISBN 978-1-57607-392-6. ^ "2002: Loune Viaud, Haiti". Robert F. Kennedy Center for Justice and Human Rights. Archived from the original on 21 May 2013. Retrieved 3 July 2012. ^ Largey, Michael (2006). "Vodou Nation: Haitian Art Music and Cultural Nationalism". p. 205. ISBN 0226468631. Retrieved 10 June 2015. ^ Geaniton, Roger (2010). "Comment devenir millionnaire en trois saisons à Manhattan" (in French). p. 248. Retrieved 10 June 2015. ^ "Pleins Feux sur »: Carmen Brouard (Port-au-Prince, 1909 – Montréal, 2005) « Une légende à la fois discrète et surprenante »". Haïti Liberté (in French). September 13, 2017. ^ Horne, Aaron, ed. (1996). "Brass Music of Black Composers: A Bibliography". p. 89. ISBN 0313298262. Retrieved 4 November 2015. ^ Kuss, Malena, ed. (2007). "Music in Latin America and the Caribbean: An Encyclopedic History Reannounce". p. 254. ISBN 9780292709515. Retrieved 4 November 2015. ^ Rowley, Melissa Jun, ed. (3 June 2014). "Haiti Isn't Asking for Handouts; It's Dancing to 'Sounds of Solidarity'". Huffington Post. Retrieved 22 October 2015. ^ Candiotti, Susan (January 15, 2010). "Haitian hip-hop artist, charity worker found dead after quake". The Marquee Blog. CNN. Retrieved 2010-01-15. ^ "Showgirl daughter of Ex-President" (Vol. 5, No. 19). Johnson Publishing Company. Jet. March 18, 1954. p. 56. Retrieved 7 July 2015. ^ Shepherd, John; Horn, David, eds. (2014). "Bloomsbury Encyclopedia of Popular Music of the World, Volume 9: Genres: Caribbean and Latin America". p. 476. ISBN 9781441141972. Retrieved 9 June 2015. ^ Press, ed. (11 July 2011). "The Story of Choucoune Stolen Legacy: The Ordeal of Choucoune". Haiti Sentinel. Archived from the original on 10 June 2015. Retrieved 9 June 2015. ^ "Beethova Obas". RFI Music. Retrieved 15 March 2015. ^ "Philippe Rouzier". La presse. Retrieved 28 April 2017. ^ Adams, David, ed. (22 April 2015). "Haitian marine biologist wins environmental activism prize". Reuters. Retrieved 22 April 2015. ^ Hurbon, Laennec (2000). Le phénomène religieux dans la Caraïbe: Guadeloupe, Martinique, Guyane, Haïti. Karthala Editions. pp. 163–164. Retrieved 24 March 2015. ^ Lacey, Marc (4 April 2008). "New head of voodoo brings on the charm". The New York Times. Retrieved 15 September 2011. ^ Schwartz, Kaley, ed. (20 May 2015). "Meet the 2014 Miami-Dade Silver Knight Award winners". Miami Herald. Retrieved 18 October 2015. ^ "Books and Books: Music for Haiti Healthy Kids – Gables". Archived from the original on 2016-03-13. Retrieved 2015-10-19. ^ "Howell Central alum Desir eyes NFL draft". St. Louis Today. December 6, 2013. ^ Dobrow, Marty (October 24, 2009). "For Ducasse, destiny leads to NFL draft". Boston Globe. ^ Leonard, Pat (November 15, 2014). "NY Rangers prospect Anthony Duclair has skills to make an impact - now and in future". nydailynews.com. Archived from the original on May 1, 2015. Retrieved May 1, 2015. ^ Dunne, Tyler, ed. (9 May 2015). "A Haitian native, Packers safety prospect Fanor knows about adversity". Archived from the original on 18 May 2015. Retrieved 11 May 2015. ^ "New Orleans Saints' Junior Galette finds sense of security with four-year, $41.5 million contract extension". The Times-Picayune. September 3, 2014. ^ "UCF Knights – Ricot Joseph Bio". Archived from the original on 2016-01-22. Retrieved 2015-11-12. ^ Wright, Mark. "Is Nico Marley, Bob Marley's grandson, NFL-ready?". theundefeated.com. Retrieved 16 May 2017. ^ Smith, Peter (2014). "2014 NFL Draft Review: Tampa Bay Buccaneers". FanSided. Retrieved 1 February 2015. ^ Futral, Isabel, ed. (11 November 2015). "Coming to America: the Djery Baptiste Story". Vanderbilt Hustler. Archived from the original on 12 November 2015. Retrieved 22 November 2015. ^ Eric, ed. (23 October 2015). "Kervin Bristol picked up by Anwil". Court Side Newspaper. Retrieved 26 November 2015. ^ Fałkowski, Michał, ed. (21 October 2015). "Haitańczyk za Antiguańczyka - Kervin Bristol graczem Anwilu". Anwil Włocławek. Archived from the original on 2015-11-24. Retrieved 26 November 2015. ^ Daniels, Evans, ed. (4 November 2015). "Four-star center Schnider Herard commits to Mississippi State". Scout. Retrieved 4 March 2017. ^ Moxley, Mitch. "Building Haiti's Dream Team: Basketball's Biggest Longshot". Men's Journal. Archived from the original on 6 October 2014. Retrieved 1 October 2014. ^ "Athlete Information > Antoine Joseph". Union University. Retrieved 1 October 2014. ^ Donovan, Jake (2006-02-06). "Andre Berto Prepares For Phase Two of His Career". BoxingScene.com. Archived from the original on 2008-12-01. Retrieved 2008-04-19. ^ Sturrup, Fred (13 January 2014). "Pro Boxing Looking Forward to More Activities in 2014". The Nassau Guardian. Archived from the original on 2015-04-15. Retrieved 9 April 2014. ^ Auclair, Phillipe (2012). "Thierry Henry: Lonely at the Top". Pan Macmillan. ISBN 978-0-230-76738-6. ^ Kaiser, Hal. "9-Player Haiti Opens CONCACAF Championship With Win Over Guatemala". The Haitian Times. Archived from the original on March 15, 2015. Retrieved March 20, 2015. ^ Press, ed. (22 August 2015). "Harte Nuss zum Heimauftakt". SÜDKURIER. Retrieved 24 August 2015. ^ Press, ed. (25 May 2005). "Une deuxième phase de championnat national riche en surprises et en suspenses" (in French). Le Nouvelliste. Retrieved 24 August 2015. ^ Etienne, Gerald, ed. (27 March 2009). "Fritznel et Janvier retenus, Saurel au tapis" (in French). Le Nouvelliste. ^ Press, ed. (9 July 2013). "El Salvador, Trinidad and Tobago end in 2-2 draw". USA Today. Retrieved 14 April 2016. ^ "Sounders FC 2 falls to San Antonio FC 3-2 at Starfire Stadium". Seattle Sounders FC. 25 April 2017. Retrieved 11 June 2017.